Our lodge offers amazing fishing on the Indian Lake chain of 10 lakes as well as countless surrounding lakes. We offer walleye, muskie, lake trout, smallmouth, northern pike, perch. We can also arrange day trips for brook trout, rainbow trout and splake and also offer ice fishing during the winter months. 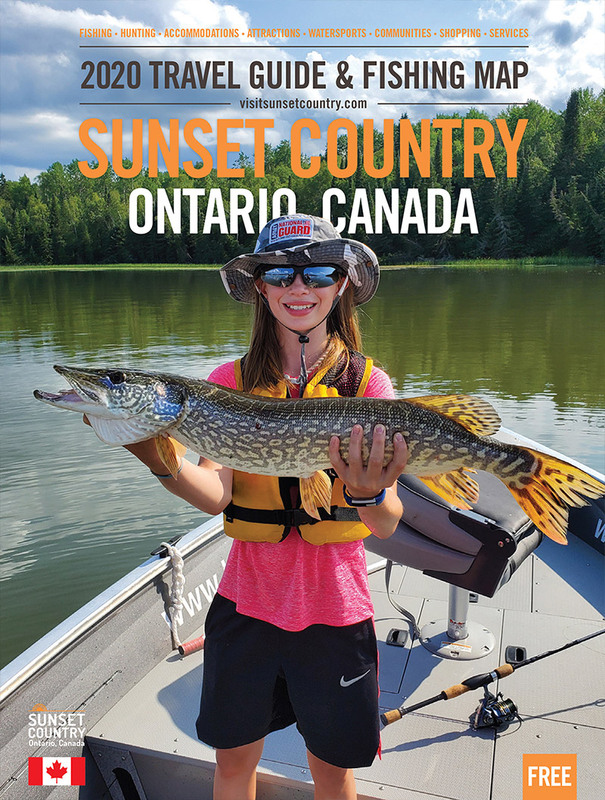 At Sunset Country Adventures we offer you all-inclusive packages that include a Housekeeping cabin with a view of the lake, 17.5’ Lund’s with 40/50 HP motors, bow mount trolling motor, gas, ice and minnows. We also have a beautiful sandy beach with a water park and great family rates. Owners and hosts Steve and Erin Smith make sure you have the time of your life. Our Motto is - Try us once, and you will be hooked!! Drive-in Access: Sunset Country Adventures is located 9 miles North of Vermilion Bay, ON. We are paved right to camp!! Cabin Rentals (Housekeeping): Choose one of our 10 beautiful cabins at Sunset Country Adventures. Every cabin has a beautiful view of the lake. Walleye: Amazing walleye fishing with a chance to catch some serious trophies. With 10 different lakes to choose from, there are endless opportunities. Northern Pike: The Indian Lake Chain anglers with some of the best opportunities for trophy northern pike. Muskie: Indian Lake Chain is the best-kept secret when it comes to Muskie fishing. This is a numbers lake but you still have that opportunity to catch that 50” fish. Smallmouth Bass: The smallmouth bass fishing on the Indian Lake Chain is exciting. These are quality fish!! Lake Trout: If a trophy lake trout is on your bucket list then the Indian Lake Chain is the place for you. Brook Trout: Summer or winter, brook trout is one of our favourite species to target here at Sunset Country Adventures. Crappie: Take a day trip to Sunset Country Adventures in the winter to chase slabs on a drive to lake. Deer: Our trophy whitetail hunts at Sunset Country Adventures are tailored to each individual hunter. Grouse: With trails leaving right from camp we offer amazing grouse hunting. Bring your hunting dog or 4 wheeler.